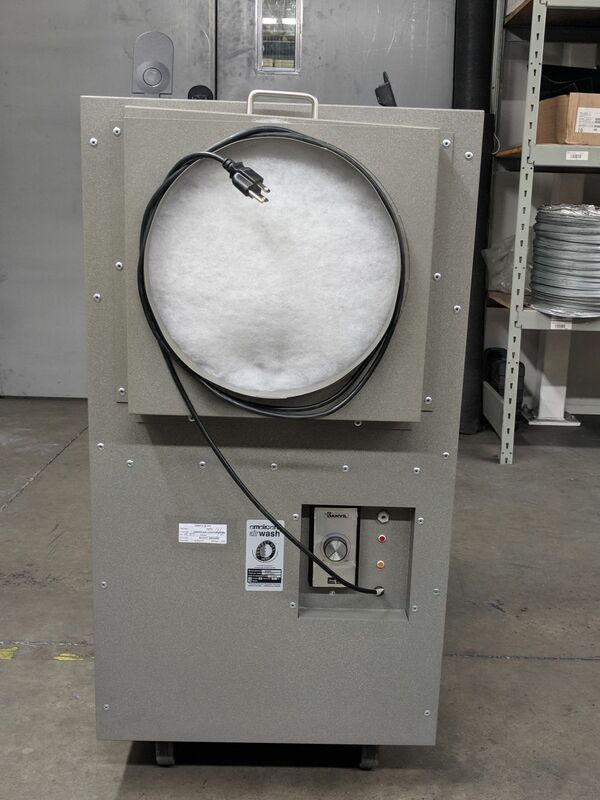 A Quality Portable Commercial - Industrial Air Scrubbing Machine for Dust Collection, Chemical Fume Extraction (VOC's, Paint Fumes, Formaldehyde, Ammonia, H2S, even Ozone and More) or Smoke Removal in Large Rooms, Workshops & Construction Job Sites with 2000 CFM and Up to 7500 Square Foot Coverage! The Amaircare BOSS MultiPro Air Filtration System! Amaircare BOSS MultiPro units are used for fast, effective air quality control in in a wide range of applications including mold and asbestos remediation, laboratories, medical marijuana processing, flooring, welding shops, oil based and acrylic paint and varnish spraying, laser printing & cutting, 3D printing, new home construction, roofing & remodeling companies, smoke eater applications, even to remove the dust associated with indoor rock climbing and other activities at gyms and fitness centers! Got Formaldehyde or Acid Gases that need to be removed? We've got you covered there, too--just choose FZ or AZ carbon filters in the options below. The Amaircare BOSS MultiPRO features a strong 2000 CFM airflow, which is enough to handle up to 7500 square feet and provide 2 complete air changes per hour, with one unit. This large capacity coverage and low price makes the BOSS an incredible value for contractors with changing needs for air filtration. The BOSS comes with 12" ducted intake and outputs for easy positive pressure or negative air, handles on the sides to easily move around the job site, in or out of equipment trailers, etc. The applications for this amazing air cleaner are almost endless. the BOSS MultiPro comes with dual 4-stage pre-flter and HEPA systems for effective particle or smoke control. With the addition of optional carbon filters, a variety of chemical and odor pollutants can also be removed. Best of all, the BOSS MultiPro offers all of these benefits usually found on much more expensive commercial air cleaners--but at an cheap discount price. If that wasn't enough, the BOSS also comes with a full 5 year parts and labor warranty, better than most commercil air purifiers that only offer one year or less. The top-rated Amaircare BOSS MultiPro is an astounding portable air scrubber value and a must for any general contractor or business owner. Order yours here today and enjoy fast, portable air quality improvement in almost any situation--for LESS! There are not many official online retailers of quality Amaircare air quality products and unfortunately the internet is full of scams. As a general rule of thumb, if the deal seems too good to be true, it probably is. Cheap cut rate online deals often end up being a used or refurbished unit, which do not come with Amaircare's top rated warranties. Or even worse, you may end up buying a cheap discount air cleaner that doesn’t have the energy efficiency, features or warranties provided by top-rated Amaircare air filtration systems. When you buy your money and energy saving Amaircare air filtration products from us, you get a brand new unit, at the best possible price, with Amaircare's amazing 5 year warranty. Our innovative partnership with Amaircare allows us to ship directly from their warehouse, which cuts out the middle man and eliminates the high operating costs of traditional brick and mortar big box stores. These savings get passed directly to you, allowing us to offer brand new dust, smoke, fume and odor-eliminating Amaircare air purifiers and filters at the best possible everyday cheap discount online sales prices. And buying from us is definitely better than direct--if you buy direct, you'll have to pay shipping. Buying from us, you always get fast free ground shipping as our thanks to you for shopping with us. If you have any questions give us a call at 1-800-701-2513 or send us an email and one of indoor air purification experts will be happy to help. Add 2-7 lb AmmoniaZorb Canisters?